There are a few times I am swayed to try a higher end brand. I think I own around 7 polishes out of the 700+ polishes I own that are over $10. I think the scary part of that is not the 7, but the 700. Lol. To be quite honest, anytime I've paid over $10 for a nail polish I've been impressed. I never felt the polishes I spent more on were not worth the extra dough. I had heard and seen great things about Butter London, so I decided to give the a try. Will they impress me like other high end brands have? Big Smoke is a denim smoky blue shimmer. I have to be honest here, this is the first high end polish to disappoint me. The color is beautiful, that is undeniable. Where this falls flat is the formula. I didn't find the formula terrible, but it wasn't great either. The formula wasn't any better than any other polish I own in the $4-$8 range. As great of a color it is, it isn't entirely unique (as in Deborah Lippman ATU/OPI DS Glamour/Nfu-Oh #51 unique), and with an average formula to match, it makes this a disappointing buy. If I'm paying $14, I am certainly expecting to notice an improvement in formula and application from the usual nail polishes I apply. Even with polishes that are on the higher end of my comfortable price range for polish purchases like BB Couture and Cult Nails, have a noticeably better formula than the less expensive brands. This formula is not as good as those brands which are in the $10 range. Perhaps, this color is just a fluke? I am doubtful I'll be purchasing this brand again, unless they create some super spectacular unique holy grail color that would negate any formula issues. Big Smoke isn't that spectacular for me to dismiss those issues. It is gorgeous. I had always heard great things about the formula. Strange. It's too bad you weren't happy with the formula. I have one Butter London polish - British Racing Green and it applies beautifully. I think I could just slap it on haphazardly and it would level itself and be beautiful. It could be the color you got or just a bad bottle. Who knows? I'd give them a try again if they have a color you love. I'm waiting to get the color Wallis from their fall 2011 collection (my niece's name and I like the color). I'll have to see how that one applies. I have several Butter London's and overall I love them, but No More Waity, Katie really disappointed me. Bummer on this one! 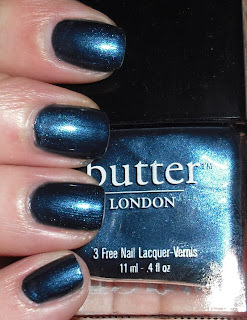 Maybe it was a fluke, I have several bottles of Butter London and they have always been amazing formula wise. No More Waity Katie was my only complaint. I need to pull out my bottle of Big Smoke to see if it is funky. I don't think the formula is bad, but I didn't find it any different than an OPI or China Glaze. I'd expect a better formula for a $14 polish.